For over three decades, the printed pages of our On the Fringe journal publications have been filled with well-written, informative articles, book reviews, poems, and illustrations on plants, ecology, plant science, nature, and so much more. To honor the writers, editors, artists, and typists, who made each publication possible, we will present original writings with additional content when applicable. We believe you will find the writings of these dedicated men and women as relevant today as when originally published. Their individual actions and collective efforts continue to make a difference. The original article was published in the March 1984, Volume 2 Number 2 issue of On The Fringe. Among the noticeable features on the winter landscape are the many and various galls to be seen. 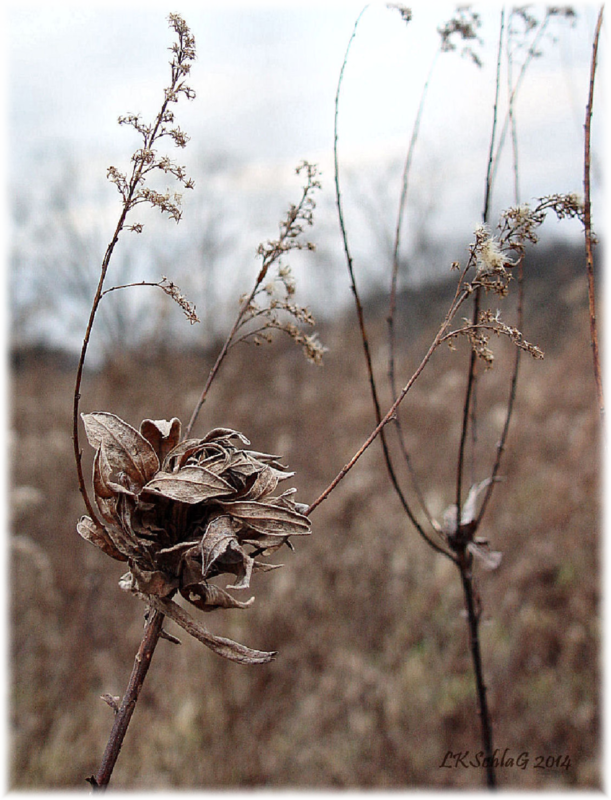 These plant deformities can be found in fields, forests and streamside. There are over fifteen hundred insects in North America that produce these unusual growths on a great variety of plants. No two galls are exactly alike. Essentially, galls are temporary housing for many different species of insects. They are formed when an insect, either through physical irritation or chemical secretion, causes the plant to produce anomalous tissue growth around the intruder providing food and shelter for the developing insect. Most of the gall producers' life histories are a mystery to us. Some of the more common galls that we see in Oho include several different goldenrod galls. The goldenrod bunch gall occurs on Canada goldenrod, Solidago canadensis, and is caused by a little midge, Rhopalomyia solidaginis. It is easily recognized by the proliferation of overlapping leaves at the meristem due to stunting of the plant stem, givng the appearance of a green, many-petaled flower. Though the gall is believed to be caused by a single larva, other insects of the same genus can inhabit the gall as inquilines, or late arrivals. The elliptical goldenrod gall is widespread in fields of annuals. Unlike most galls, this one is caused by a moth, Gnorimschema gallaesolidaginis. In the autumn the adult lays the eggs singly on the lower leaves and stem of the goldenrod. The insect overwinters as a hardened egg and emerges in the spring to burrow into the end buds and travel down the stem. Where the insect stops is where the gall develops along the stem. The larva feeds until midsummer, pupates, and emerges in late summer as an adult. 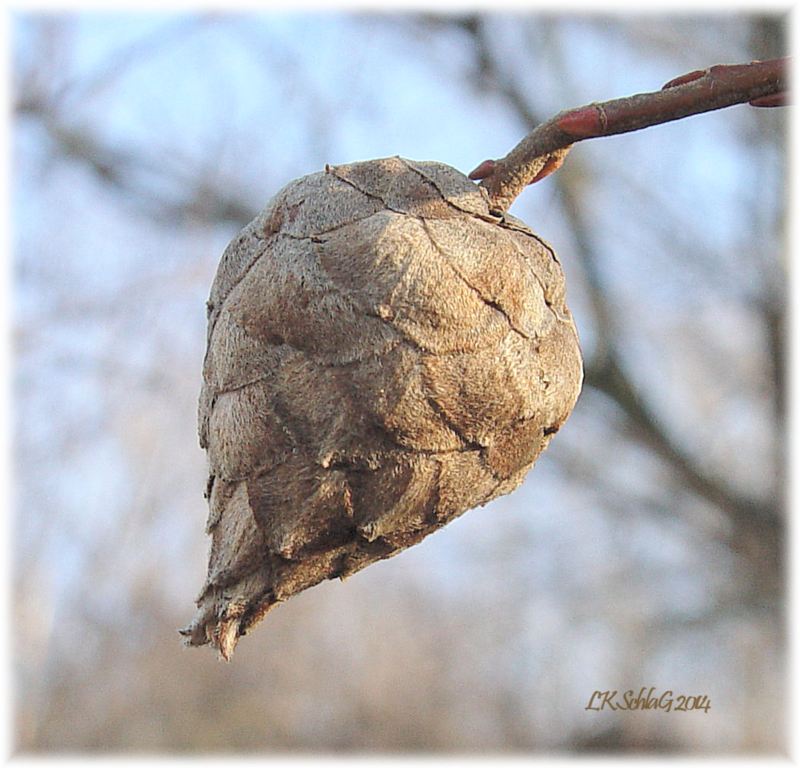 The gall, when seen in winter is without its maker, with a small exit hole near the top as the evidence of its leaving. Often other insects and spiders will utilize the chamber for shelter. 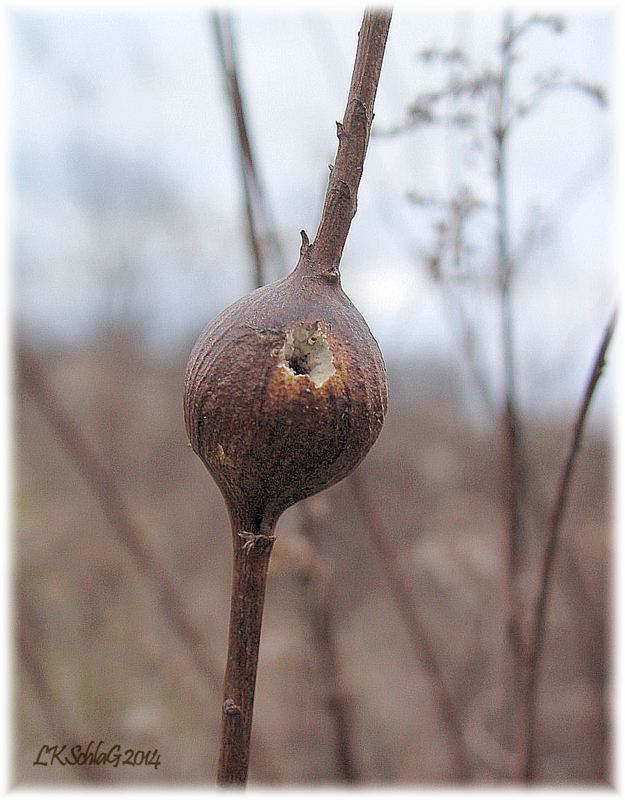 The goldenrod ball gall is one of the most common galls. Causing a ball-like swelling of the plant stem, it is probably the most widely recognized of all the goldenrod galls. It is produced by a small spotted-winged fly, Eurosta solidaginis. The eggs are laid on new stems in the late spring and early summer. After hatching, the larva burrows its way into the stem. It then hollows out a living chamber while the plant creates the large globe-like gall around it. By winter the larva is quite mature, but it will overwinter in the larval stage. It resumes its activity in the spring by boring its way to the outermost layer of the gall and then returning to the chamber to pupate. The adult emerges in the late spring. It is quite vulnerable during the winter months and a number of insects and other animals are known to feed on these larva, including downy woodpeckers. Large holes in the galls are evidence that the tenant provided a midwinter banquet for a diligent downy. 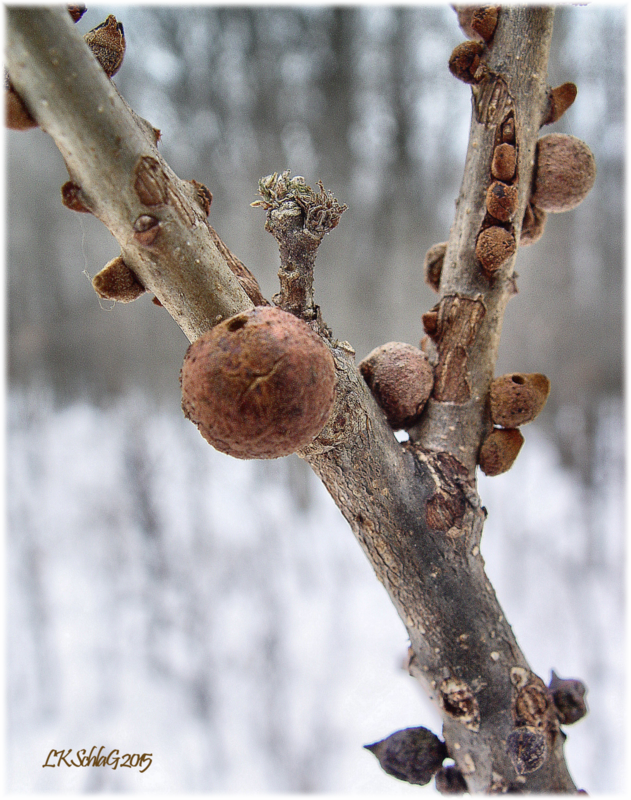 Other galls commonly seen during the winter include many types of oak galls (over 800 species), and several willow galls, some of which look a lot like small pine cones. Galls make interesting winter study because they are so highly visible at this time of year and because they readily show the diversity of interrelationships among plants and animals.